Today we issued a news release and are e-mailing all American Board of Internal Medicine (ABIM) Board Certified physicians to announce that the ABIM will not require Practice Assessment, Patient Voice and Patient Safety in its Maintenance of Certification (MOC) program through December 31, 2018. You can read the entire news release on ABIM.org. It notes that no internist will have his or her certification status changed for not having completed Practice Assessment, Patient Voice and Patient Safety activities through 12/31/18. I do want to emphasize that the other components of the MOC program remain in place: participating physicians need to take and pass an exam every 10 years, earn 100 MOC points every five years and complete some MOC activity every two years. Because we believe that improving the quality of care is a critical skill of the modern physician, I also want to let you know that ABIM will continue to award MOC points to physicians who choose to do approved Practice Assessment activities, and one of the pathways for these points is through the American Board of Medical Specialties (ABMS) Multispecialty Portfolio Approval ProgramTM. ABIM has heard from many stakeholders that it is good for patients when physicians regularly evaluate and improve the quality of their care, so we need to do a better job recognizing the meaningful quality improvement activities you are already doing. We all share the values articulated by the ABMS that embody a commitment to professionalism and the importance of physicians staying current, increasing patient safety and reducing harm and improving patient care. Your input has informed today’s announcement and has led to several significant programmatic changes over the last two years. You can continue to guide ongoing improvements to the MOC exam experience through a survey we recently opened and included in our e-mail outreach today. 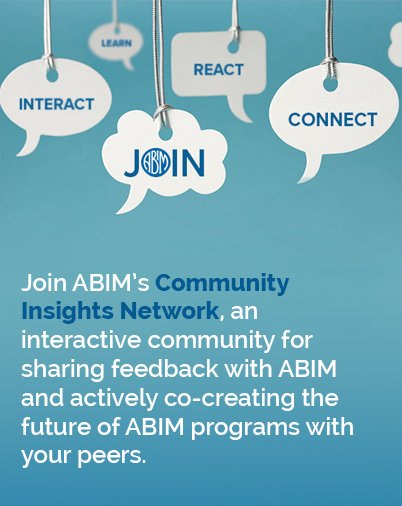 If you have not yet completed the survey, you can access it on your My Home Page after logging into ABIM.org. It will be open through January 18, 2016. We want all of you to have a say in what the MOC program might look like in the future, so please take five to 10 minutes to share your valuable thoughts and ideas with us by completing the survey.